BROWNING WOOD HANDLE FOLDING KNIFE WITH POCKET CLIP BRAND NEW!!! "BROWNING" Tactical Folding Knife. Excellent quality knife with very sharp blade. Weight of the Knife: 4.2oz(120gms). Hi! Welcome to Weaim2pleez. Here is a Browning Cocobolo Linerlock Knife. 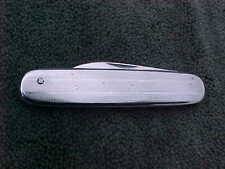 Measures 4 1/4" (10.8 cm) closed with 3" (7.6 cm) blade. Cocobolo handles and dual thumb studs. Stainless pocket clip. Item #br0096. BRAND NEW in box! BUY IT NOW!! . Browning "Black Label Pandemonium" Liner-lock folding pocket knife. Excellent quality knife with razor sharp blade. Blade shape & Edge: Tanto point with Razor sharp edge. Knife weight: 5.1oz (144gms). Closed length. 3.25" bead blast finish stainless steel blade. Brown wood handle. Stainless steel bolster. Thumb stud. Pocket clip. 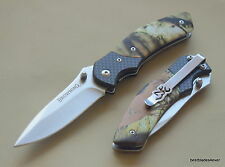 Blade features laser cut Buckmark logo and the NWTF logo is laser etched. 5" closed. 3.75" satin finish stainless drop point blade. Brown pakkawood handle. Thumb stud. Inlay shield. Pocket clip. Bone handle knives are made with cow bone. We Combine orders! 4.13" closed. 3" 8Cr13MoV stainless Wharncliffe blade. Black G10 handle. Thumb stud. Pocket clip. Tribal blade artwork. Bone handle knives are made with cow bone. Yes, we combine orders! This is a "Browning, model # 2333, made in China" 2.5" blade, 4" folded. this is a very used knife, it you know and want to work on it great for you to own, i think if you know how to clean and repair knives. Hi! Welcome to Weaim2pleez. Here is a Browning Linerlock Knife. Measures 3 3/4" (9.53 cm) closed with black finish stainless blade with dual thumb studs. Black finish stainless frame with brown rich grain wood inlay on front handle. Lanyard hole and black finish stainless pocket clip. Item #BR277. BRAND NEW in box! BUY IT NOW!! . Hi! Welcome to Weaim2pleez. Here is a Browning Cocobolo Linerlock Knife. Measures 4.63" (11.8 cm) closed with 3.25" (8.3 cm) 440 stainless drop point blade. Cocobolo wood handles with lanyard hole. Thumb studs and pocket clip. Item #br0094. BRAND NEW in box! BUY IT NOW!! . Hi! Welcome to Weaim2pleez. Here is a Browning Framelock Black/Cocobolo Knife. Measures 4 1/2" (11.43 cm) closed. Black finish stainless blade with laser cut Buckmark logo and ambidextrous thumb studs. Black finish stainless frame with cocobolo wood onlay handles and stainless pocket clip. Item #BR069. BRAND NEW in box! BUY IT NOW!! . "BROWNING" wood handle folding pocket knife. Includes stainless steel pocket clip with carved browning logo. Excellent quality knife with very sharp blade. 3.88" closed. 3" Damascus steel drop point blade. Ebony wood handle. Bone handle knives are made with cow bone. We Combine orders! BROWNING "Long Haul" folding pocket knife. This knife is the bigger version of Browning "Long Haul". Includes stainless steel pocket clip with carved browning logo. Excellent quality knife with very sharp blade. Browning Large Signature Lockback Knife model 708 - Partially Serrated Drop Point Blade - Made in Seki Japan - Specifics are Has a reversible brass thumb stud for one hand open. High Carbon AUS-8A stainless steel drop point blade. 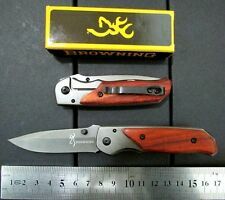 Browning "Vortex Bird & Trout" Liner-lock folding pocket knife. Vortex knives are a modern take on classic Browning knife design. Built from high quality 440 stainless steel, they'll hold a keen edge. What's the tang stamp read?. Browning China. How will you receive your knife?. What's the length of largest knife blade?. The knife in the picture is the exact knife you will receive unless otherwise stated. 4.5" closed. 3.5" satin finish 7Cr17MoV stainless drop point blade. Black G10 handle. Stainless bolster(s). Extended tang. Thumb stud. Pocket clip. Bone handle knives are made with cow bone. 4.25" closed. 3.25" satin finish stainless blade. Black textured G10 handle. Thumb stud. Pocket clip. Black nylon pouch. Bone handle knives are made with cow bone. Yes, we combine orders! We have a Browning pocket knife a real beauty, the Blade is Genuine Damascus steel over 500 layers of steel were used to make this blade and Damascus is way up there on the Cutlery Blade/Steel/ Index, all you need to do is keep it oiled and this blade will last for generations plus it is fantastic looking. Browning Prism II Black Folding knife. Excellent quality knife with sharp blade. Blade Edge & Type: Plain, clip point blade. Knife weight: 1.8oz (51gms). Blade material: 440-A stainless steel. Browning Sporter Series Lockback Knife model 242 - Single Fine Edge Drop Point Blade - Made in Seki Japan - Specifics are High Carbon AUS-8A stainless steel drop point blade. Blade is new unused with original edge - Tip is intact. 3.13" closed. 2.25" satin finish stainless drop point blade. Black G10 handle. Thumb stud. Pocket clip. Combo includes 3.63" overall flashlight. Black aluminum body. Spot to flood lens. 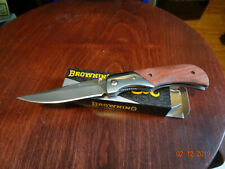 HERE IS ONE OF BROWNING MOST POPULAR FOLDING KNIVES MODEL BR-588, This pocket knife is 3 1/2" closed and weighs 1.8oz. this is one big reason people love it so much, its a great (EDC) knife. It has a Burlwood Handle very good looking with all of the grain and colors and if you wipe it down with a protective sealant it will look allot nicer. "BROWNING" Rosewood folding pocket knife. Includes stainless steel pocket clip with carved browning logo. Excellent quality knife with very sharp blade. Hi! Welcome to Weaim2pleez. Here is a Browning BR174BL Duration Linerlock Knife. Measures 4 1/4" (10.8 cm) closed with 3 3/8" (8.6 cm) titanium coated stainless partially serrated blade with dual thumb studs. Textured green G10 handles with integrated seat belt cutter and glass breaker. Features four way reversible stainless pocket clip. Item #br174bl. BRAND NEW in package! BUY IT NOW!! . 3.5" closed. 2.5" satin finish stainless drop point blade. Black checkered aluminum handle. Pocket clip. Thumb stud. Also includes LED cap light with Stars and Stripes artwork. White Nichia LED and green LED. BROWNING "Long Haul" folding pocket knife. This knife is the smaller version of Browning "Long Haul". Includes stainless steel pocket clip with carved browning logo. Excellent quality knife with very sharp blade. 4.75" closed. 3.75" satin finish 7Cr17MoV stainless blade. black textured G10 handle. Lanyard hole. Thumb stud. Pocket clip. Bone handle knives are made with cow bone. We Combine orders! 4.63" closed. 3.63" satin finish stainless clip point blade. Brown wood handle. Lanyard hole. Pocket clip. Thumb stud. Bone handle knives are made with cow bone. We Combine orders! Assisted opening. 4" closed. 3.13" satin finish 440A stainless drop point blade. Black G10 handle. Carbon fiber bolster(s). Thumb stud. Pocket clip. Bone handle knives are made with cow bone. Assisted opening. 4" closed. 3.63" 440A stainless drop point blade. Black G10 handle. Lanyard hole. Pocket clip. Thumb stud. Bone handle knives are made with cow bone. Eradicate Linerlock. 4.88" closed. 3.88" black stonewash finish 440 stainless tanto blade. Black G10 handle. Pocket clip. Glass breaker. Thumb stud. Fuller groove. 3.88" closed. 3" satin finish stainless clip point blade. Brown pakkawood handle. Stainless bolster(s). Thumb stud. Pocket clip. Bone handle knives are made with cow bone. I am here to earn your trust and provide you with a product you can rely on. 4.25" closed. 3" white ceramic blade. Thumb stud. Pocket clip. Three interchangeable blade inserts: Drop point, bird and trout, and guthook. Black nylon pouch. Bone handle knives are made with cow bone. 4.13" closed. Satin finish 8Cr13MoV stainless clip and spey blades. Brown jigged bone handle. Stainless bolster(s). Buckmark Inlay shield. Bone handle knives are made with cow bone. I am here to earn your trust and provide you with a product you can rely on. Hysteria Linerlock. 3.75" closed. 2.5" black stonewash finish 7Cr17MoV stainless drop point blade. Black G10 handle. Thumb stud. Pocket clip. Bone handle knives are made with cow bone. We Combine orders! New Browning 4 1/2" closed lockback. 3" Sandvik 12C27 stainless clip point blade. Finger grooved handles. Black nylon belt sheath. Eye & Ear Protection. We Provide Free Local Pick Up on all orders. 3.5" closed. 2.5" satin finish 8Cr13MoV stainless drop point blade. Ram's horn handle. Stainless bolster(s). Inlay shield. Bone handle knives are made with cow bone. We Combine orders! High carbon Sandvik 12c27 stainless steel plain edge blade. Brushed brass handle with Cocobolo wood scale inserts. By purchasing this item, you are stating that you are at least 18 years of age and that you are aware of the knife & weapon laws in your city, county and/or state. 4.5" closed. 3.5" satin finish stainless drop point blade. Brown wood handle. Stainless bolster(s). Thumb stud. Lanyard hole. Pocket clip. Bone handle knives are made with cow bone. 4.88" closed. 3.5" black stonewash finish stainless drop point blade. Blade etching. Pocket clip. Thumb stud. Bone handle knives are made with cow bone. We Combine orders! 4" closed. 3" gray finish stainless drop point blade. Thumb stud. Lanyard hole. Pocket clip. OD green paracord handle accents. Snap closure with structured profile. We Combine orders!